Preliminary results have been posted on the website at http://www.parando.org/PA200k_Results171202.pdf. Results will be submitted to RUSA in a few days and become final at that time. Fifteen riders clipped in for the final R-12 brevet of 2017. All fifteen eventually returned for another organizer's favorite 100% completion rate. Temperature at the start was in the upper 20s which had many riders hopping around to keep warm. Clear and sunny conditions allowed a quick warming to the mid-40s where it remained for much of the day. 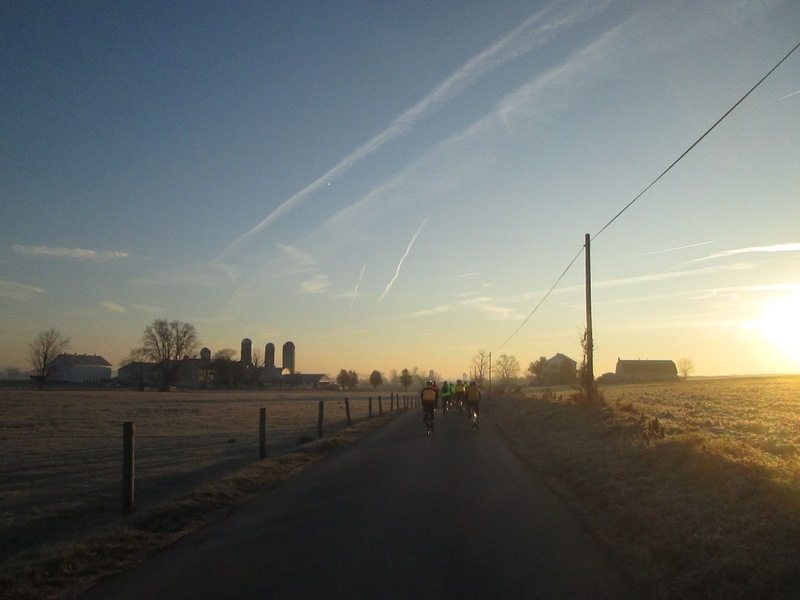 The sun and light winds made conditions about as good as could be expected for a December brevet and most riders enjoyed themselves. All but the earliest of finishers were treated to a few miles riding under a beautiful full moon which rose at sunset. So while first finishers Gavin Biebuyck and Cameron O'Mara can claim first finisher bragging rights, those of us who took a bit longer were treated to more of nature's beauty. Finishers were greeted by volunteer Steve Kraybill at the Highland Pizzeria. I'm sure he was regaled with many great stories. Steve rode the brevet route as a permanent earlier this year and is familiar with each and every hill it has to offer. He would know embellishment. Regular James Haddad once again decided he needed only one gear to get around the route and brought his fixed gear bike. After hearing stories of Jim Holman's exploding cassette, James sat back as smiled rather smugly. One can only wonder what thoughts ran through his mind while climbing Hill Rd or spinning down Yellow Mountain Rd. To his credit, he uttered not one complaint to the route designer. Congratulations to Jeff Lippincott who with this completion notched his first R-12 award and a PA R-12 at that. It is notable that Jeff is following the path of several other PA randonneurs who commenced an R-12 string with their very first brevet. 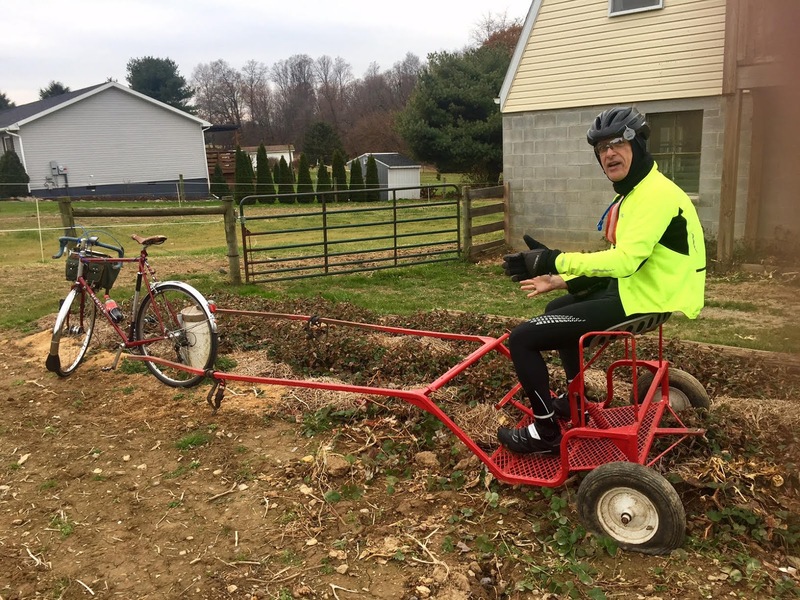 Jeff's first was in January 2017 on the Beyond Hope to New Hope brevet and he has completed nearly every event on the PA calendar since. He also found time for 1000k and 1200k events which allowed him to complete a RUSA Cup award. Jeff has been busy in his first year of randonneuring and is well-positioned to notch the ACP R-5000 award. Chappeau Jeff! From Rudy Mayr: Many thanks for this and all the other brevets you've put on in 2017! Yesterday's ride had beautiful scenery, acceptable weather, memorable aromas, great camaraderie and excellent beer and pizza at the end. Well done all round! Rudy's ride pictures can be viewed online. Michael Povman commented: Thanks again to you and the team for organizing yesterday’s ride. While it was challenging I enjoyed the terrific farmland scenery and the well-maintained, quiet roads. In fact on some I counted more Amish buggies than cars! The weather was as good at it could have been for a December brevet, and after sunset the full moon lighting up mostly deserted roads made the last couple of hours a highlight for me. Looking forward to doing this one again sometime. Joe Ray had this to say: Had a great ride yesterday - perfect weather, cold but calm winds, great roads and scenery. It was also a treat being able to see the only Supermoon of 2017, both as it was setting on the drive west to get to the start and again on our right heading north to the finish as it rose. Pizzeria finish is a definite plus. Thanks to you and volunteers for making it all possible. Matt Farrell: Thanks for running the course again. It was a near perfect Dec day to do the ride. I struggled for most of the middle of the ride but came around at the end. Sorry to have missed you at the end of ride celebration. Once again, fellow PA Randonneur organizer Chris Nadovich and I lead from the back of the field, though perhaps a bit further back than intended. Chris arrived from Easton sans helmet. Fortunately volunteer Ned Schantz was able to retrieve a helmet that fit while I wrapped up the registration details. Ned showed up to offer his help at the start and saved Chris' ride. Thanks Ned! We return to the east in January with the Beyond Hope to Hopewell brevet on January 6. Details will be posted soon. Thanks to everyone who participated in 2017 and to all the volunteers who have pitched in to make the year such a success. Hope to see you all in the coming year.